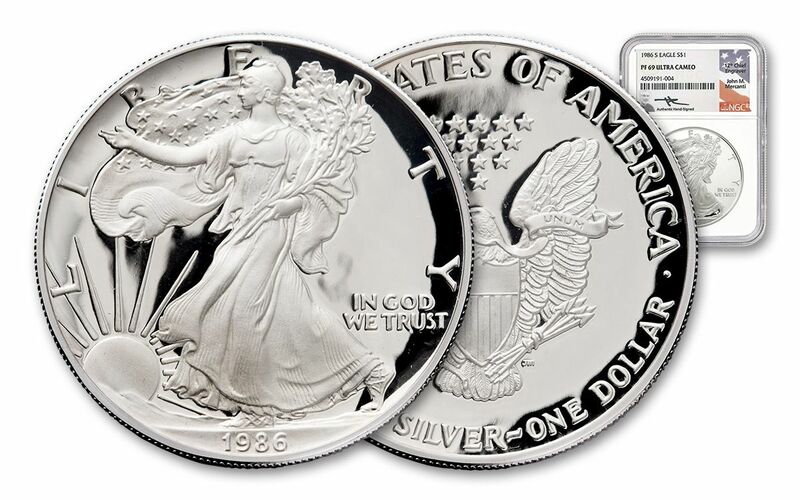 First-Year Silver Eagle Proofs Signed by Designer John Mercanti! 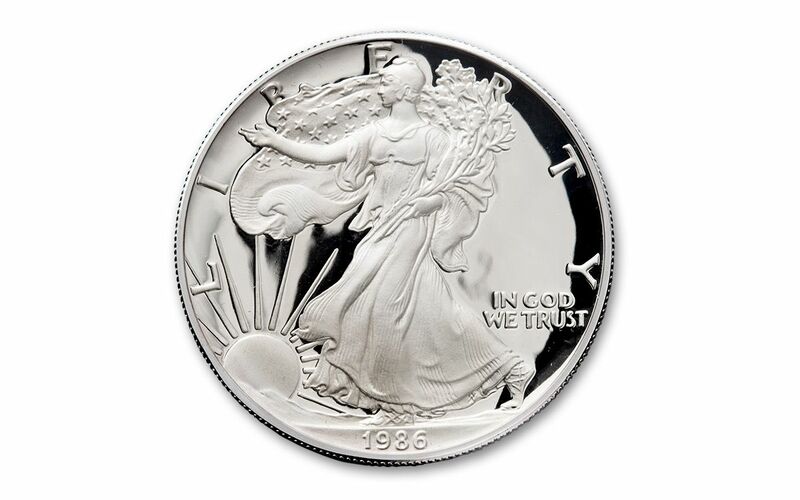 Congress authorized the first ever Silver Eagle program in 1985 with the first coins of the program rolling out of the U.S. Mint's doors in 1986. However, only a limited number of proofs were minted that year (about 1.5 million) in San Francisco. Since this was before the advent of professional grading, most of these were socked away in private vaults, where many probably remain to this day. 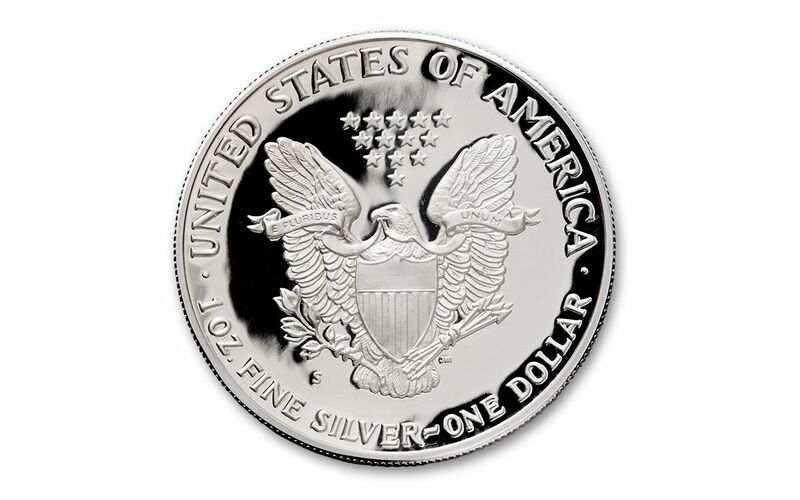 The obverse of the Silver Eagle depicts Adolph Weinman’s popular Walking Liberty design, the same image that was pictured on circulating silver half dollars produced by the U.S. Mint between 1916 and 1947. We’ve managed to locate a small number of these first-year Silver Eagle Proofs, each graded Proof-69 Ultra Cameo (PF69 UC) by Numismatic Guaranty Corporation (NGC). These near-perfect coins are virtually the highest grade available, but what makes them even scarcer is that each label is hand-signed by John Mercanti, the 12th Chief Engraver at the U.S. Mint and the designer of the Silver Eagle's reverse! 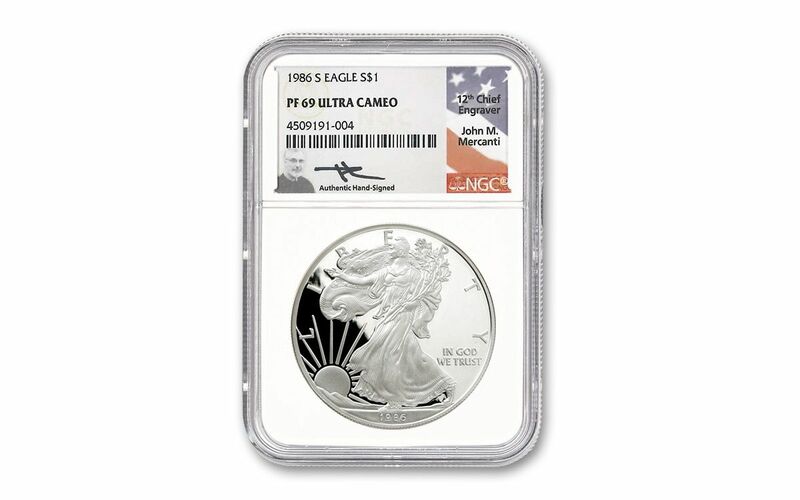 Secure these first year Silver Eagle Proofs for your collection now while we still have them in our vaults!